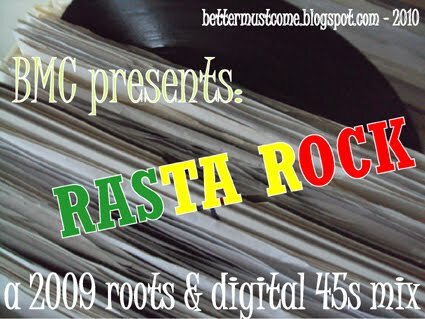 Another modern roots mix with strictly 2009 tracks. No Jamaican productions in this one, mainly EU productions, with a few from the US. Roots and digital are the main ingredients for this one, variety of artists, producers and styles. Wicked tunes in this one people, trust me. Same recipe as always, one continuous mix, no full tunes, added sound samples and source-info given so you can go and track down these tunes yourself. Happy to see Barry Isaac in the mix! Yeah, I speak to Barry every now and then when he appears with his stand at Europe's biggest record fair in Utrecht, Netherlands. Last time, november last year, I bought this track of him, covering the Burning Spear classic. Wicked dub too! r the lucky man tracks 45's? Yes papajoshua, one 45 in fact, the Lady Lex is on the flip of the Courtney John. The Lucky Man tune is cut short on the 45 though, compared to the version I've heard on youtube, where the track changes style somewhere after a minute or two. That's where the 45 stops. nice set bmc, many thanks for posting it. i basically rely on you to distill the year into the best bits. Thanks bill, that's very nice to hear! Glad you liked this one too. Cheers.